* Collaborative programs include a bachelor’s degree from the Mount and an advanced degree from a collaborating partner school; this requires attendance at both schools. ** Pre-health Professions and Pre-law are advisement tracks with a separate major. At Mount Saint Mary College in Newburgh, New York, you can create an exceptional college experience that goes far beyond a degree. The Mount is a Catholic and Dominican liberal arts college on a beautiful 60-acre campus overlooking the Hudson River Valley, about an hour’s train ride away from Midtown Manhattan. The College offers more than 50 academic programs and some of the most comfortable residence halls you’ll see on any campus. 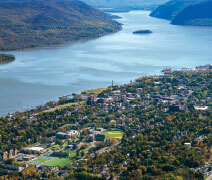 The Mount became a four-year college in 1959, but its roots as an academic presence in the Hudson Valley go back to 1883. The founding Dominican Sisters’ traditions of truth, service, and leadership have remained constant as the College has grown. The Mount offers a wealth of choices, with more than 50 academic programs to choose from. New programs have been developed to address the changing job market: a major in Criminology and concentrations in Sports Management, Actuarial Science, and Cybersecurity are all recent additions. A variety of five-year programs leading to an MBA or MSEd give students the opportunity to earn a bachelor’s and a master’s degree within five years, saving time and money. Our highly regarded master’s degree programs in Business, Education, and Nursing each have specialized accrediation and have produced exceptional leaders, including two recent New York State Teachers of the Year. A strong liberal arts core curriculum provides a well-rounded education that strengthens students’ understanding of their chosen subject area. It also helps students find new interests and strengths if they are still deciding on a major. The Summer Undergraduate Research Experience (SURE) is just one of the research opportunities Mount students enjoy. 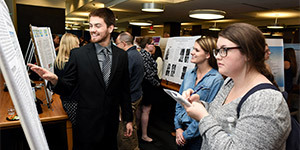 In this program, students are paid to work with faculty members on summer research projects in science, business, education, mathematics, psychology, and more. Mount students expand their talents and interests with diverse student activities on campus. They enjoy College events with their peers, participate in community service, and learn to organize and lead in a wide variety of student clubs. Twenty-one intercollegiate varsity teams and intramural activities encourage teamwork, discipline, social interaction, and healthy competition among our students. The Mount features an all-season turf athletic ﬁeld, six outdoor tennis courts, and a new ball field. The College’s recreation center has a track, competition-sized pool, and basketball court. The Mount has a robust internship program with many opportunities extending from New York City to Albany. Mount students have interned recently at ABC TV, Mayo Clinic, the Brooklyn Nets, Elle magazine, Pratt and Whitney, and Sony Corporation. Expand your horizons with a short-term or semester-long study abroad experience. England, France, Ireland, Italy, and New Zealand are just a few of the possibilities. The Mount is dedicated to helping you navigate the ﬁnancial aid and admission process and offers academic and need-based scholarships. More than 99% of our freshman class receive financial aid.